﻿ Bird's Party Magazine - Party Ideas and Inspiration for Everyday Celebrations! We are proud to bring you via each issue, a compilation of our best work and exclusive photo shoots, to help your plan and create stunning parties and events for all of life's seasons and celebrations, and each issue is packed with party ideas, styling, recipes, DIY party crafts, cake design inspiration and eye candy for birthdays, weddings, baby showers and holidays celebrations! 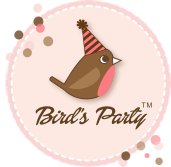 Bird’s PartyTM Magazine is an online and printed publication for all things party - Full of amazing birthday inspiration, entertaining ideas, DIY Tutorials, party crafts, recipes, industry tips and eye candy galore, it has been received with great success since its launch in Dec 2010! All your party supplies under one roof - Shop for cute party decoration, printable party supplies and stationery for birthdays, baby showers, weddings, seasonal events and holidays celebrations.